I’ve had an interesting relationship with Star Trek films over the years. Many people think that the odd–numbered ones are bad. Based upon my earlier article (Why The Motion Picture is my Favorite Star Trek Film) the first one has the deepest significance for me. I’m also partial to number three, The Search for Spock. So, obviously, I think the odd ones are fine. But, honestly, the only Trek film that I can’t stand is Insurrection. I can find something likeable in virtually all of them — yes, even number five, The Final Frontier. 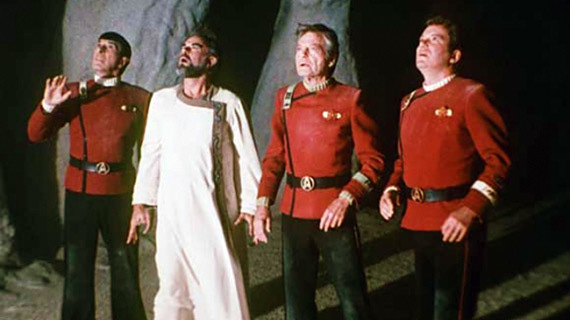 An encounter with “God” at the conclusion of Star Trek V: The Final Frontier from 1989. As for Trek on TV, like a lot of fans, I was pretty frustrated by the latter years of Rick Berman’s tenure as Executive Producer (although I blame Brannon Braga far more than Berman). I facetiously called Voyager ‘Star Trek Lite’ — and don’t even get me started on Enterprise. While the narrative that 24 producer Manny Coto brought to the final season was a bit more on track, it was really too late. 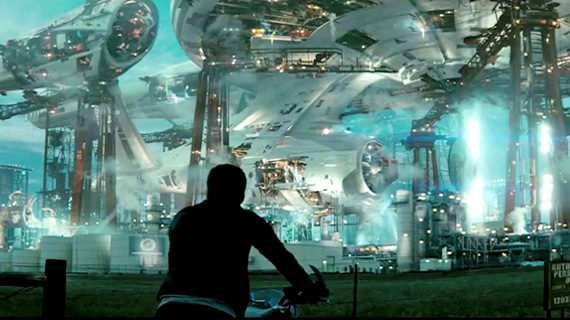 The modern Star Trek franchise was becoming recycled, trite, and creatively bankrupt. I was happy to see the 18-year run — that began in 1987 with The Next Generation — come to an end. It was time to give it a rest. But, deep down, I felt that production would return eventually. I was right. 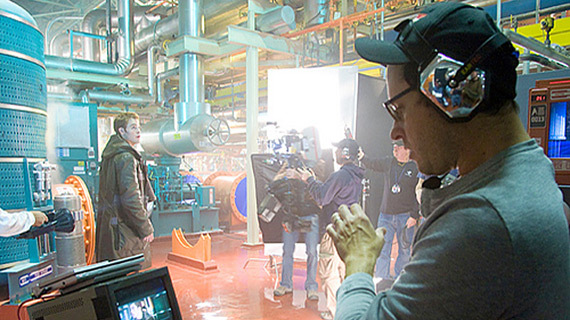 A year later, in 2006, the announcement came that J.J. Abrams was taking over the property with a new film. The teaser poster featured the emblem of the original series. Oooh, a reboot! That was exactly what the forty–year–old series needed. As a fan of Lost, I was pretty excited. Abrams’ feature film directorial debut, Mission: Impossible 3, was fairly smart and entertaining. He’s a smart guy, so I figured that I would keep an open mind. 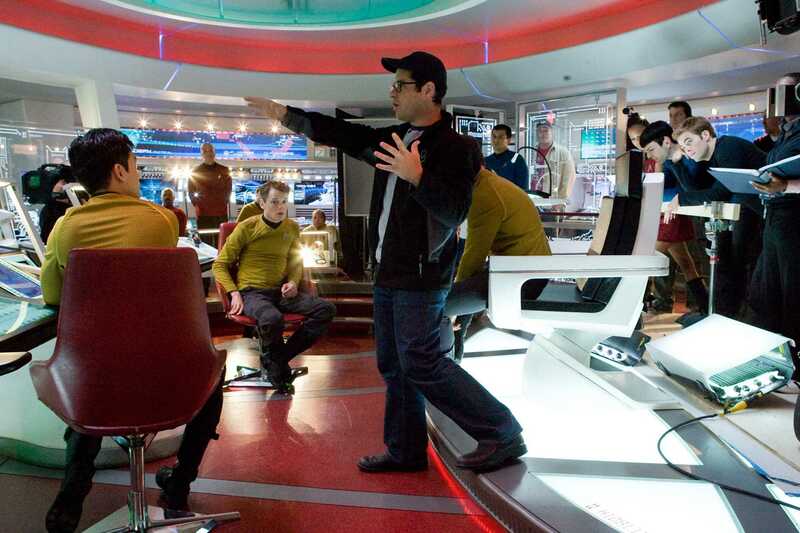 On the set of the Enterprise bridge, J.J. Abrams directs his reboot of the original Star Trek. When the teaser trailer appeared in January of 2008, I had some questions. While I loved the audio of JFK, I was deeply concerned about the Enterprise being constructed on Earth. It just didn’t make sense. I didn’t see why a ship that big would be built on the surface of a planet. But again, I remained open-minded. The production values were excellent. I read it had the highest budget ever for a Trek film. Cool. Maybe we would get something truly epic — that didn’t feel like a glorified TV episode on the big screen. Once I saw the first full-length trailer, it didn’t look too bad. 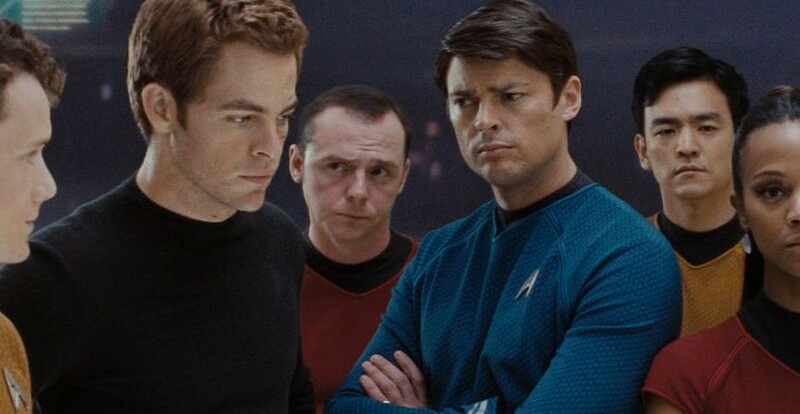 I was not that impressed with Chris Pine’s Kirk, but the other actors looked pretty good. Especially, Karl Urban as Bones. 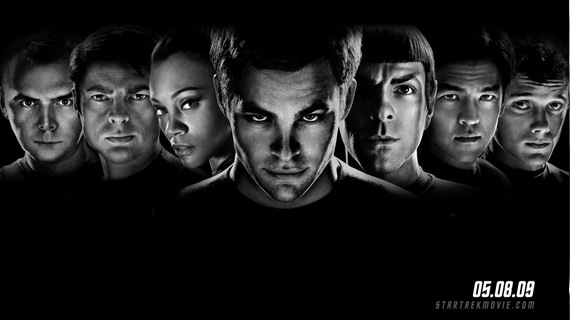 A pre-release promotional poster for Star Trek (2009) featuring the principal cast. I finally saw the simply-titled Star Trek at a free advanced screening a week before its debut. I was not enthused or impressed. In fact, I was a little angry. I’m glad I didn’t spend any money. Why? Where do I begin? 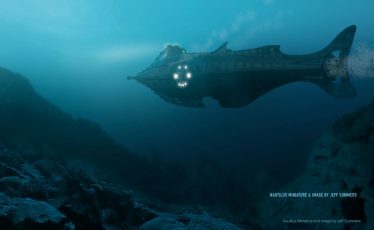 The problems started with video I saw of the PR tour before the film’s release. 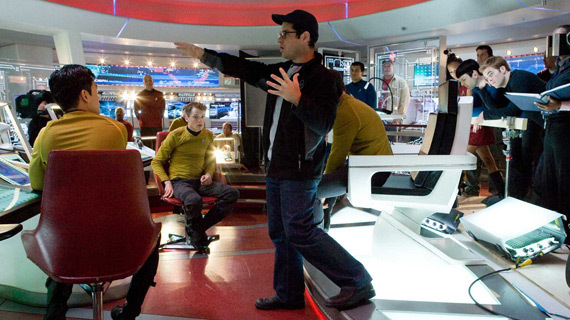 J.J. Abrams was always quick to point out to the press that he was never a fan of Star Trek. He said it as if he was almost ashamed to be associated with such a geeky phenomenon. Abrams’ first love was Star Wars. Well, he managed to finally make his own version of George Lucas’ classic. That’s exactly was what Star Trek (2009) became — a Star Wars ripoff. 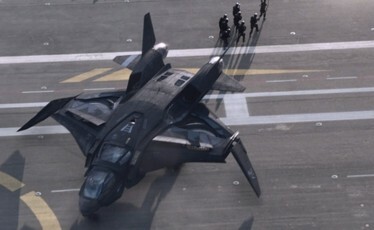 The visual effects team jettisoned all of the Trek traditions, like the Warp streak and flash, and instead imitated the Star Wars hyperspace jump. Gone were the passing star fields that, to me, always exemplified the name of the show! The new film’s key plot points — like a fatherless farm boy challenged by an elder to leave his home and venture into space, and an entire planet being destroyed halfway through — were completely derivative of Star Wars. The only problem is that the two franchises have nothing to do with one another and never should! They are based on totally different foundations. 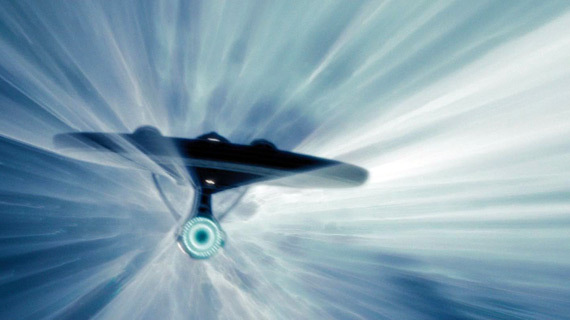 An example of the Enterprise’s new Star Wars-inspired Warp effect. In fact, the pseudo–science of Trek was what rooted the series for me. While they definitely stretched the physics and made things up via significant ‘technobable’ (especially on The Next Generation) there was still some sense of reality and possibility. That was totally thrown out the window on Abrams’ reboot. First off, the film starts off with a ship emerging from a weird space anomaly that looked like a black hole. 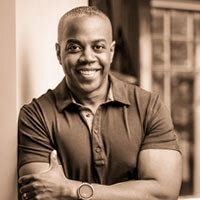 I had heard that the lead scientist for NASA’s Cassini mission, Carloyn Porco, was the science advisor for the film. I’m sorry, but she did not do a very good job. The entire film is riddled with horrible science. I mean horrible! A supernova that threatens the entire galaxy? Maybe a gamma ray burst could do that, but a not a supernova. And what about Red Matter? At the end of the film, a black hole forms INSIDE a Romulan vessel! The crew sends messages back and forth while the spacecraft is slowly being consumed. I thought black holes sucked up everything — even light. Surely, it can stop radio signals. 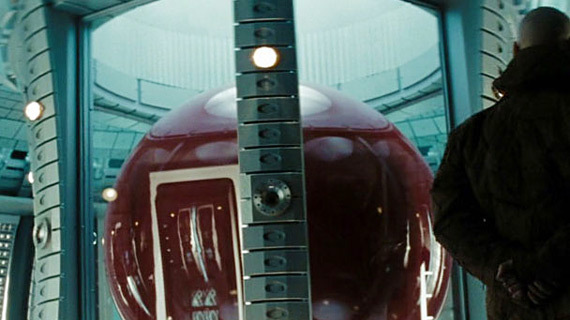 Just a drop can destroy Vulcan, but a huge ball of the stuff takes forever to dissect a ship? Then the Enterprise, after dumping multiple Warp cores and exploding them, escapes the black hole. How does that work? Red Matter? I don’t get it. Seems a little contrived. What’s Up with the Sets? The set designs were atrocious. The Kelvin was hideous inside and out. There are clear PLASTIC curtains inside a shuttlecraft? Engineering and other parts of the Enterprise were shot in a brewery. That’s right, a brewery. And it looked like it. The film had a $150,000,000 budget and it was shot in a brewery?! What about the bridge? It looked like an ADHD Apple Store. Who could possibly work with all of those lights and lens flares glaring at them all the time? Why wouldn’t the film’s designers give even a little sense of the original design? The Engineering Deck was an Anheuser-Busch brewery in Van Nuys, California. I had absolutely no sense of how the outside of the ship corresponded to the interior. The sets were incongruous and inconsistent. A 2001 hallway connected to what looked like a steam plant. A turbolift that takes you from engineering to the bridge in two seconds. What the heck was going on with the production team? Lastly, the design of the ship itself — which was more than twice the size of the original. 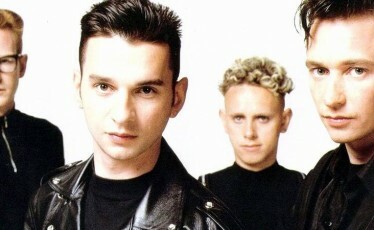 The new look completely destroyed the aesthetic of Matt Jeffries and Andrew Probert. It was a mess of oversized nacelles (that are too close together) and an oddly elongated engineering section connected to a saucer that was some sort of ripoff of the ship from The Motion Picture. And why the would they possibly build it in the middle of Iowa?!?! How did they get that out of Earth’s gravity well and into space? Enough on the design. How about the narrative? The story was virtually incomprehensible. It tried to be both the old Trek and some new conglomeration. Things made no sense, if you knew anything about the Trek canon. And, sorry, since they weren’t actually starting the story over from scratch — the presence of Leonard Nimoy precluded that — I had to take the old canon into consideration. Pike commanded the Enterprise years before Kirk was around. The Enterprise wasn’t new when Kirk took command. Spock and Bones were both considerably older than Kirk. Delta Vega — where Kirk is marooned — was a planet they visited in the second Star Trek pilot that was situated on the rim of the galaxy, and not (what appears to be) an icy moon of Vulcan. But these issues were minor. 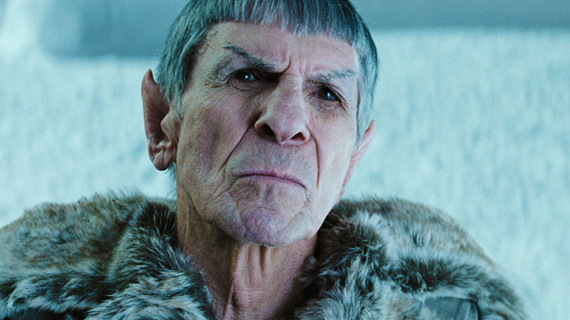 Leonard Nimoy reprised his role as the Vulcan Spock to provide continuity from the original timeline. A few questions that plagued me: How would a ship come out of a black hole? And, then, why would it just start shooting at you for no reason? Why would Kirk run into old Spock in the one cave he was hiding in on an entire planet? That’s the same as being randomly dropped off on Earth and chased by a mugger into the one McDonald’s where your best friend is eating. Speaking of that: why would the new Spock jettison Kirk in an escape pod? Why not just put him in the brig? Then, once on the surface of Delta Vega — Kirk is chased in a lame, derivative (Star Wars: Episode One, YUCK! ), and very pointless action sequence. Plus, why would a leather-skinned lizard creature exist on an ice planet? AND how far away was Delta Vega from Vulcan? 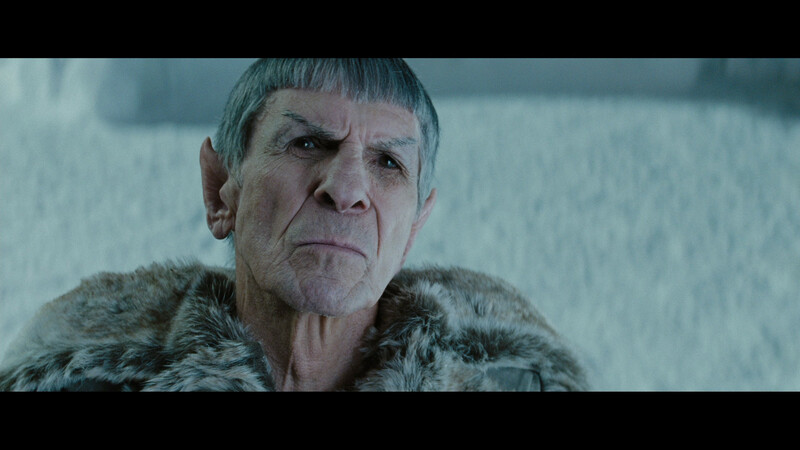 Old Spock could see it destroyed like it was as far away as the Earth’s moon. Closer even! The whole Romulan subplot was pointless and lacked any real motivation. Nero had to be one of the weakest bad guys in the history of Star Trek. Blathering, murdering, and scene–chewing. It was simply awful. And, can I add that the little gremlin assistant to Scotty was out of left field and just plain stupid? Ultimately, I think that many scenes were contrived for sensationalism — to keep viewers from getting bored. For example, Kirk’s big hands and Scotty beaming into a water pipe. 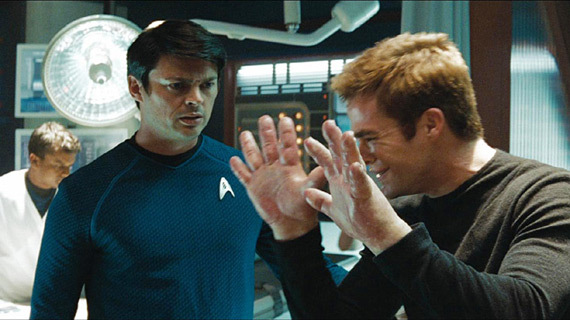 Kirk’s big, allergic reaction hands… What does this have to do with Star Trek? You may wonder if there was anything I liked about the film. Actually, I did enjoy some of character interactions. I liked the visual realization of Vulcan — especially the school and stalactite buildings — and Ben Cross played a fine Sarek. The bottom line for me: Star Trek (2009) was awful, and it really causes me to worry about the future of my favorite sci-fi franchise. I have had this argument with a lot of people. They say, “But it was fun and it reminded me so much of the old show!” Really? I find that hard to believe. If the film had not been called Star Trek and played on the pop cultural zeitgeist and good will that the franchise had built over so many years, people would have thought the film was utter nonsense. Folks went in with a feeling of warmth and nostalgia that kept them from truly seeing that mess for what it was. I’m completely fine with the idea of a reboot. But, then, actually reboot it and do an intelligent job. Don’t act like all that came before is irrelevant. After all Star Trek had been around for four decades when the keys were handed to Abrams. Clearly something must have been going right for it to have endured that long. 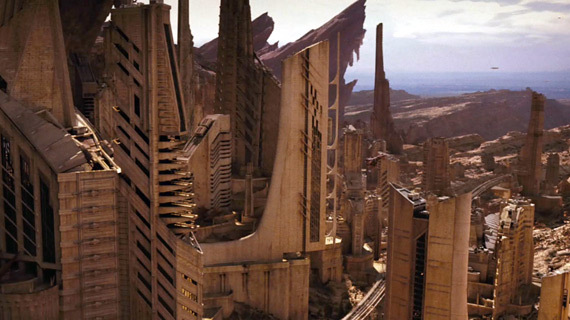 Buildings on the planet Vulcan — truly one of the film’s few inspired designs. Production is underway on Star Trek 2. Again, I will try to have an open mind, because Abrams’ Trek is currently the only game in town. I think it’s still possible to have an intelligent and comprehensible story — filled with action and effects — that can reach a broad audience. No matter what, though, let’s hope that they build their own engineering set this time and stay away from Budweiser. Oh, one final thought: why would a third-year cadet be promoted to first officer? I would like to see that happen on one of our naval vessels!